You might not know it this week with the Great Minnesota Get Together in full swing, but to believe some of the rhetoric during last year’s election season and the legislative session, there are really two Minnesotas. One of those Minnesotas is full of lakes, farms, country roads and, depending on who you ask, a lot of hardworking folks who feel their needs aren’t being met and their message isn’t being heard, or misguided bumpkins who vote against their interests. The other Minnesota, a metropolis straddling the banks of the Mississippi River, is made up of two growing cities and their suburbs, with increased infrastructure demands and, depending on your thinking, a bunch of people trying to make a good life for themselves and others, or a den of liberal busybodies taking up state resources and pushing their agenda on people who live far away. The urban-rural divide is at the forefront of many conversations in Minnesota. How different is life, really, in different parts of the state? In a lot of cases when people talk about the urban-rural divide, they seem to be talking about the metro versus the rest of the state. and rural areas, largely agricultural areas outside these cities and towns with less than 2,500 residents and where most people don’t commute to a larger town. Eight percent of Minnesotans live in rural areas. Breaking the state’s population down in this way reveals a few key differences. Rural and small-town Minnesota are older than its cities. Sometimes by quite a bit. The median age in Twin Cities counties tends to be in the 30s, while in some counties in northeastern Minnesota around 50. A larger share of people in rural Minnesota are older than in urban Minnesota. Interestingly, the youngest counties in Minnesota are actually large-town counties like Blue Earth, home to Mankato (median age: 30), Clay County (home to Moorhead; median age 32), and Beltrami and Stevens counties, home to Bemidji and Morris (median age: 33). All of these areas have higher education campuses and some have relatively sizable minority communities. But broadly, Greater Minnesota is also grayer Minnesota. With age comes wisdom — and sometimes, different ideas about what’s important and how things should work. Age also brings different housing, medical and social needs. Still, it’s important to remember scale, said State Demographer Susan Brower. While the share of the population that is graying may be smaller in urban areas, the silver tsunami is still huge because those areas are so populous. “There’s quite a bit of similarity in how much rural areas will need to deal with aging compared to small towns, large towns and even urban areas,” Brower said. Coupled with an aging population, a declining birthrate and migration to urban areas spells workforce shortage for employers across Minnesota, but one that’s expected to be felt especially acutely in parts of Greater Minnesota, which could put a damper on the economy there. Minnesota’s urban and big town areas are expected to face a labor shortage, too, but have shown a greater ability to attract workers from outside the state — and country. Much of the angst surrounding the urban-rural divide has to do with economics. In some ways, there is an economic urban-rural divide and in other ways, not so much. City dwellers are far more likely to work in professional and scientific fields, and financial, insurance and real estate fields than people in Greater Minnesota. Small town and rural-dwellers are more likely to work in natural resources jobs and construction jobs. In urban areas, full-time, year-round workers make more money than in other parts of the state. But they also need more money to live: According to the Minnesota Department of Employment and Economic Development, the cost of living for a two adults and two children is nearly $96,000 in Hennepin County, the most expensive place to live, compared to about $53,000 in Stevens County, the least expensive. All four regions in Minnesota have relatively low poverty rates — 2 percent in urban areas, 4 percent in small and big towns and 5 percent in rural areas for full-time workers — but the differences between them are striking, with people in rural areas more likely to be living in poverty despite working. “We found that rural, small town, and large town residents who work a full-time schedule are two or more times more likely to live in poverty than urban residents who do so,” the State Demographic Center report notes. Part-time workers were more likely to be in poverty in urban areas than in other parts of the state. While some parts of Greater Minnesota tended to take longer to recover from the Great Recession, unemployment rates are currently low throughout most of the state — even lower in some non-metro areas than in the Twin Cities themselves. 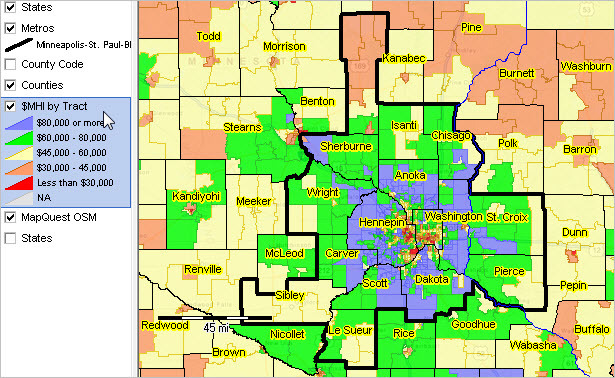 Certainly, Minnesota’s rural areas are more white on average than its urban areas. “If you’re looking at the composition of the population, you see largely white, non-Hispanic populations in rural and small-town Minnesota. That’s less true of large towns and urban centers,” Brower said. Rural areas and small towns are less racially diverse than big towns and urban areas in Minnesota. It also has fewer immigrants. But the share of nonwhite and foreign-born Minnesotans living outside the metro is changing, particularly in regional centers and agricultural areas where immigrants have moved for work. Jobs and income, age, race and place of birth: these are some of the ways rural and urban Minnesotans differ, at least in ways we can easily measure. But that’s often not the heart of the matter. Katherine Cramer, the author of “The Politics of Resentment: Rural Consciousness in Wisconsin and the Rise of Scott Walker” and a University of Wisconsin-Madison professor began studying the urban-rural divide in her home state in 2007 after she realized the depth of resentment of Milwaukee and Madison in other parts of the state. “The people I listened to felt like they were on the short end of the stick. They felt they were not getting their fair share of power, resources or respect. They said that the big decisions that regulated and affected their lives were made far away in the cities. They felt that no one was listening to their own ideas about how things should be done or what needed attention,” she wrote in the Washington Post. In Minnesota, this chasm has been particularly visible in the debate over transportation funding. Often, this debate has been framed as light-rail for the cities versus roads for rural areas. That was a sticking point for people in some parts of the state, who feel that the metro isn’t paying its share into the state’s transportation fund. An analysis by the Star Tribune earlier this year found that’s a misperception. It found that the metro contributes about 52 percent of the vehicle sales and fuel taxes and registration fees and receives 32 percent of it back in transportation funding (to be fair, rural areas have 87 percent of lane miles and got about two-thirds of the funding). A new survey of rural and small town America, published this year by the Henry J. Kaiser Family Foundation and the Washington Post, found that perceptions like this often fuel the sense of an urban-rural divide. “One of the big things we found is that people in rural areas are more likely to feel like they have a sense of shared values with other rural Americans, and people in cities don’t share those values,” said Liz Hamel, director of public opinion and survey research at the Kaiser Family Foundation. Hamel and her colleagues also found that rural Americans tended to have more pessimistic views about their local economy: more of them said they’d recommend young people move away in search of opportunity. “People just felt like there wasn’t an economic future for young people, there was not good access to well-paying jobs,” Hamel said — even though urban and rural Americans reported being able to pay bills at similar rates. And even if urban and rural Minnesotans feel divided from one another, it might not matter much. A 2011 study by a Minnesota Rural Partners researcher documented the extent the economies of urban and rural Minnesota are interdependent. Like it or not, we’re all in this together. Submitted by Jeff Klein on 09/01/2017 - 12:01 pm. The rural roads vs. city light rail debate is so bizarre. It seems like those in rural areas want roads because they think they should get *something*, regardless of its utility. I’ve yet heard an articulation of why they need more roads other than “congestion” fantasies in places like Brainerd. Outstate Minnesota is already deeply overbuilt with roads; we have empty 4-lane highways and sprawling suburban strips in pretty unpopulated places; often they damage what’s left of the old downtowns and will be a huge financial liability in the future in terms of maintenance. What a huge opportunity cost. I’d like to see the residents of outstate Minnesota get more creative in their demands than pointless roads or environmental destruction to an almost sadly comical scale in exchange for a small handful of temporary jobs. Failing that, it may be time to move where the opportunity is. Submitted by Todd Hintz on 09/01/2017 - 12:56 pm. A lot of Greater Minnesota people are moving to where the opportunities are. I have to wonder though if there isn’t a better way to get the job done than to have everyone move to a large city. In turn, that means those areas also need fewer subsidies from the Twin Cities to maintain their infrastructure. Were I in the legislature, I would be pushing hard to get high speed rolled out to the entire state as quickly as possible, then tout to the rest of the country what a good place Minnesota is to live and work. Remember Governor Anderson on the cover Time magazine in the 1970s? We can repeat that again in just a couple of years. Submitted by B. Dalager on 09/01/2017 - 02:38 pm. Paul Thissen has been championing Greater Minnesota high speed internet for at least the last seven years…probably before that. But I remember him being one of the only gubernatorial candidates to have that as a plank. Submitted by Harris Goldstein on 09/01/2017 - 01:23 pm. I live part time in downtown Minneapolis and part time in the Brainerd area, so I see both perspectives first hand. I frequently drive to/from and around Brainerd and Minneapolis. And I’m a frequent user of light rail in Minneapolis. From what I see, the money spent on rural roads are not for new roads nor (with few exceptions) added lanes to existing roads. Rather it’s to maintain existing roads, make some high traffic intersections safer, repair bridges and in a few cases add lanes at relatively small high traffic areas. So I question your assessment that they want something regardless of it’s utility. Outstate residents want smooth roads as much as metro residents. I can only assume that your definition of a “pointless” road is one that you don’t travel. Kind of like outstate residents complaining about spending on light rail in the metro because they don’t use it. The rural road vs. metro light rail debate is a valid one in the sense that we have limited dollars for transportation infrastructure. (And, of course, there’s a big debate between metro road and light rail.) But the debate is heightened by those who fail to see that both metro and outstate has suffered from neglect of infrastructure and fail to recognize that different solutions are needed for each. Submitted by Jeff Klein on 09/01/2017 - 02:23 pm. I guess my definition of a “pointless” road is one that doesn’t even begin to provide the utility that compensates for its maintenance costs. I would go so far as to suggest that perhaps silky smooth roads that see a few hundred cars per day is simply not a realistic expectation; or if those citizens were given the choice they may decide that high speed internet, as noted above, is a way better deal. In any case if it were strictly maintenance, I’d care considerably less, but time and time again we find that “money for roads” ends up being more than 50% for expansion, which is the definition of unsustainable. Then there’s the irony of out-state legislators not letting metro citizens tax *themselves* for transit projects. I occasionally visit a family cabin in central MN, the road to which is currently undergoing a huge expansion. Maybe some day it will save me ten minutes on the way there. That doesn’t mean I support it. One glance should be enough to indentify it as a deeply wasteful project – and it’s not the only one (additionally tens of millions of dollars to expand roads largely to service mostly upper-middle-class white cabin traffic is the worst kind of wealth transfer). Is the new light rail deeply wasteful? Hard to say, I guess. I don’t love the through-the-woods routing, and can’t help but wonder what we could do with better bus service for that kind of money. But at the end of the day, nobody is asking out-state citizens to pay for it. Submitted by John Ferman on 09/01/2017 - 12:30 pm. I wonder what the State tax & fee revenue distribution over the four categories would look like. Similarily for the amount of State government spending. I have heard that most State revenue comes from the metro and that the rurals are complaining about not getting enough. So the money in/out distributions would be valuable to know. Submitted by Gene Nelson on 09/01/2017 - 12:55 pm. The total population in MN in 2016 was 5.52 million. The Twin Cities metro area was 3.55 million, leaving 1.97 million for outstate. Interesting that this repub party tries for divisive politics instead of honesty, claiming the rural areas are underfunded when they’re not and Jeffrey Klein’s comment also covers this issue quite accurately. I understand that what is good for all is good for MN, but that doesn’t seem to be the message from our divisive repub party. Submitted by Mike Downing on 09/01/2017 - 01:29 pm. Elitist politicians often rationalize their viewpoints and decisions rather than simply asking people open ended questions and simply listening to them. If they simply listen to people and their needs & concerns they can represent them more effectively. Submitted by RB Holbrook on 09/01/2017 - 02:55 pm. Your comment is puzzling, at best. Are you saying that Democratic politicians should split their votes, and vote as if they were Republican some times? Should Republicans be held to the same standard? I don’t see you calling out Tom Emmer or Jason Lewis for not listening to their more liberal constituents. Are Democrats the only ones obligated to act differently? Submitted by Pat Terry on 09/01/2017 - 04:10 pm. The problem is that people are often wrong. As others have pointed out, rural folks are under the impression that they are subsidizing the Metro – a narrative pushed by Republican politicians. The reality is the opposite – the Metro is subsidizing rural Minnesota. If anything, Democrats need to do a better job educating people in rural areas about the actual facts and correcting their misguided beliefs. Its hard to do when correcting facts is seen by some as elitist. Submitted by Jim Winterer on 09/03/2017 - 09:12 pm. I was a freshly minted journalism grad in 1971 when I had the great fortune of landing a job as editor of the newspaper in Two Harbors, and later that decade in Grand Marais., two county seats along the North Shore of Lake Superior. Having worked on the William A. Irvin ore boat during college, I thought I was fairly familiar with the North Shore, but I soon learned firsthand the level of animosity that many on the North Shore held for those who lived in the “Cities.” Yikes! I started work there not many years after the creation of the BWCA, and I worked on the paper throughout the yearslong Reserve Mining dispute. Those were just two of the issues that I think fed some of that animosity. At any rate, I’ve always been interested in this topic and really enjoyed reading this piece by Greta. Nice work! Submitted by Ray Schoch on 09/04/2017 - 01:36 pm. I’m not sure good roads are roads “…that people don’t need,” but much of the rest of Todd Adler’s comment seems spot-on to me. Much of the widely-reported resentment in rural areas might be alleviated by a sense, based in reality, that Minnesotans on farms and in small towns throughout the state were, in fact, connected by high-speed internet service to Minnesotans living in Woodbury, Maple Grove, Moorhead, Mankato, Rochester, St. Paul and Minneapolis. I think Mr. Adler is correct to point out the crucial role that the web plays for business in a staggering variety of fields and interests. Since all politics is local, it seems fair to point out that high-speed internet service is something promised to greater Minnesota by the state’s Republican Party from the time I arrived in 2009, and perhaps before. Yet, given the opportunity, the state’s GOP has done little or nothing to make good on that promise. As Ms. Kaul has pointed out, 87% of the state’s road lane miles (the vast majority of them, I presume, paved), are in rural areas, yet those residents feel slighted because they’re not getting 87% of the road funding. Meanwhile, 3/4 of the state’s population—three quarters! !—lives in about a dozen areas that qualify as “urban.” This lends credence to Mr. Adler’s perception that perhaps rural Minnesota’s rural roads are “over-built,” and, for what it’s worth, I’m inclined to agree with Jeffrey Klein’s comment that a legislative choice to “…expand roads largely to service mostly upper-middle-class white cabin traffic is the worst kind of wealth transfer.” A similar kind of wealth transfer happens in Colorado, where, instead of a “cabin” on a lake, lots of people have, or at least aspire to, a “cabin” in the mountains. The party that many/most rural and small-town residents have tended to vote for has failed utterly to keep the promises it made to those rural and small-town voters. Unless/until that inaction on the part of the state’s GOP is addressed, rural and small-town Minnesotans will apparently continue to emulate “What’s the Matter with Kansas?” and, in political terms, shoot themselves in the foot by voting against their own economic interests. Truth-telling is a rare commodity in politics, but recent years have seen it nearly vanish altogether, especially at the hands of the political party that likes to characterize itself as the more “conservative” of the two. And, since most of the state’s population (and broadband customer base) lives in urban areas, it seems likely that the most efficient way (perhaps not literally the “only” way, but certainly the more efficient one) to bring broadband service to rural (and traditionally “conservative”) areas is for the state (i.e., mostly urban taxpayers) to subsidize that service, and in a far larger absolute amount than any perceived subsidy by rural dwellers for urban transit. The whole purpose of government is to provide for the public those services people are unable to provide for themselves individually. When “conservative” politicians rail against this sort of government interference in “the market,” it’s useful to point out that a state subsidy to help pay for broadband access everywhere in the state is little different, if it’s different at all, from the government providing roads, and “conservative” politicians seem to think state-subsidized roads are just fine. Submitted by John Appelen on 09/04/2017 - 09:03 pm. The reality is that much of the spending on rural roads is so that us urban and city folks can get to cabin country and our beautiful parks. I am pretty certain the folks who live near Brainerd had no need for a huge highway and bypass. And do you think the North Shore residents need huge roads to handle their local traffic? The big cities receive a huge amount of local government aid and school funding from the state. And those coffers are filled by the well to do suburbanites that people here like to disparage. Submitted by Nick Foreman on 09/05/2017 - 09:38 am. Brainerd and the North Shore are making a fortune because of those roads. Without big cities, rural mn would simply disappear. Submitted by John Appelen on 09/05/2017 - 02:40 pm. I do agree that the rural tourist areas appreciate the business that comes up those roads. But my point still stands that they were not built for the rural folks… They were built because urban and suburban folks travelled that way often and the road sizes needed to be improved, increased and maintained. By the way, often the people operating tourist businesses up North are people who used to live in the metro. And many people seem to be retiring up there. Submitted by Nick Foreman on 09/05/2017 - 04:24 pm. Name and address for those metro people operating those tourist businesses!! Now you complain that the metro does help rural mn. Make up your mind! Submitted by John Appelen on 09/05/2017 - 05:25 pm. My point all along is that much of the money spent in out state MN benefits everyone who travels the State. And the idea that rural projects are only completed to benefit our rural citizens is incorrect. Therefore this “who gets more from the State coffers” is just an exercise in divisive politics. Submitted by RB Holbrook on 09/05/2017 - 11:08 am. Not all suburbs are alike, unless you will put Wayzata and Plymouth in the same category as Richfield and Brooklyn Park. There are ‘burbs that have more in common with the core cities than they do with the more affluent outlying areas. Submitted by John Appelen on 09/05/2017 - 02:34 pm. However many of the affluent Suburbs are very different from the “urban” areas. I am just tired of urban folks here saying that they are subsidizing the rural communities when it is actually the affluent suburbs that are subsidizing both the rural and urban communities. In my case I live in Plymouth and have worked in Hamel, Osseo and Eden Prairie. Why would one throw me in the “urban” bucket? I spend far more time in rural MN than urban MN, appreciate out state roads more than light rail, etc. Submitted by RB Holbrook on 09/05/2017 - 03:41 pm. “I am just tired of urban folks here saying that they are subsidizing the rural communities when it is actually the affluent suburbs that are subsidizing both the rural and urban communities.” Do you have a source for that? Because whenever I see a figure for where the tax dollars come from and where they go, it’s broken down by county, not city. I would be interested in seeing a more detailed breakdown. “I spend far more time in rural MN than urban MN, appreciate out state roads more than light rail, etc.” Just going by sheer numbers, there are more of us spending our days in urban MN than in rural MN. Appreciation of a transportation mode is in the eye of the beholder. Submitted by John Appelen on 09/05/2017 - 05:14 pm. No source, folks like Greta usually like to heap us altogether… (ie 7 county metro) Even though we are vastly different in economics, beliefs, etc as one can see from how the votes vary greatly. I would be fascinated to see a comparison of inside the 494/694 loop and outside it. I am fine with riders and the communities served by light rail paying for it. However since it is pretty much limited use (ie commuters), I just don’t agree with it being paid for at the state / federal level. I just don’t see tourists and businesses getting a big benefit. Where as those rural interstates sure get a lot of use by a lot of different people. Submitted by Dan Landherr on 09/06/2017 - 02:44 pm. You don’t see tourists benefiting from a rail system that offers easy access from the MSP airport to Mall of America, US Bank Stadium, Target Field, Xcel Energy Center, Target Center, Guthrie Theater, Minnehaha Falls and the University of Minnesota? That’s pretty much a list of where tourists go in the Twin Cities. Submitted by John Appelen on 09/06/2017 - 11:27 pm. Good, does that mean we can be done building Light Rail now? I mean it looks like folks who fly into town can now avoid renting a car and visiting more of the metro. As for non-flying tourists… I am pretty sure most of them use the roads to get to those tourist locations. At least my friends and relatives do. By the way, I do appreciate the Light Rail between Terminal 2’s bargain parking and Terminal 1. The concern I have though is that usually the trains are running pretty empty. Hopefully there are more riders closer to downtown. Submitted by John Appelen on 09/05/2017 - 03:48 pm. This map seems to show the real story pretty well. If you want better resolution it looks like they offer it at the source site. Submitted by RB Holbrook on 09/05/2017 - 04:19 pm. Thank you for providing this. It does show the figures well. Just a small quibble with your conclusion, though: while affluent suburbs likely pay more per household in income taxes, the aggregate dollars flowing from them is smaller than would be coming from the core cities. More importantly, when sales taxes are considered, more is flowing from the core cities than the affluent suburbs, just because there is more taxable commercial activity in the cities. Submitted by John Appelen on 09/05/2017 - 05:03 pm. I think you really need to visit the burbs more. A huge number of corporate head quarters, stores and manufacturing plants are located out here beyond the 494/ 694 loop, and since we are in a state where income taxes are progressive… Big bucks from all those wealthy tax payers. Pretty much the only time I go East of 169 is if my daughter has an activity in that direction. Now I am not trying to pick a fight with the urban dwellers, I am just noting that others in the State are paying a lot for those Urban Schools, Local Government Aid fees, Government Buildings / Jobs, Museums, Stadiums, etc. And claims that the urban folks are vastly different from the rural folks economically are vastly over stated here. Submitted by RB Holbrook on 09/06/2017 - 09:26 am. “And claims that the urban folks are vastly different from the rural folks economically are vastly over stated here.” Agreed. “I think you really need to visit the burbs more.” I lived in the burbs for several years, and still venture there on occasion. I’m not afraid of them–honest, I’m not! Submitted by Karen Sandness on 09/08/2017 - 08:52 pm. I’ve sometimes wondered about the mutual stereotyping that rural and city people indulge in. You get rural people who think that going to the Twin Cities will land them in an environment similar to what they see on reruns of “Law and Order.” You get city people who think that rural people are one step above the Beverly Hillbillies. I’m reminded of the program from decades past in which children from Northern Ireland were brought to Minnesota for summer vacation, mostly to get out of the stressful environment that prevailed during the unrest there. A side benefit was that the children saw Protestants and Catholics getting along, mixing socially, and not hating each other, something outside their previous experience. What if every high school in Minnesota had an exchange program with a school in the “other” environment? The urban kids would spend one semester of their four years as exchange students in a small town, living with a host family. The rural kids would spend one semester of their four years as exchange students in a city, living with a host family. The main complication I can see is the racial disparity between the two environments. Parents might not want their kids to live with a family of a different race or religion and might not want to host someone who didn’t match their family. But isn’t that what exchange students do? And I’ve never met a former exchange student who regretted the experience.